Let’s face it – communications can be a tough gig. Whether you’re new to the field, or a seasoned pro, you likely know the value of communicators sharing their stories of both triumph and tribulation. That’s why – through personal stories of success, achievements, moments, and overcoming adversity – we’re pleased to share stories that inspire us through IABC/BC’s annual signature event. With the theme ‘Standing Your Ground’ last year, we heard personal anecdotes from diverse speakers, in what proved to be a motivating, entertaining, and, at times, profoundly moving evening. 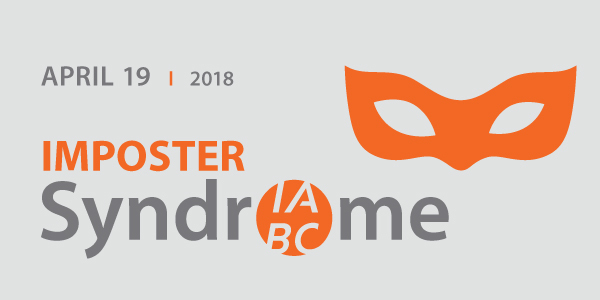 Following on the success of last year’s event, we’ll once again be focusing on these defining moments in our careers as communicators, this time with the theme of Impostor Syndrome. As we navigate our communication careers, there are times we experience moments of self-doubt. Can I do this job? Am I qualified? What if everyone in the room is smarter than me? Do I really deserve this? These feelings of inadequacy persist even in the face of evidence to the contrary. Whether we’ve been thrown in the deep end, promoted when we didn’t feel ready, jumped into a brand new arena, or taken a big risk, these moments of doubt and uncertainty are common, but rarely discussed. Luckily, the best way to beat imposter syndrome is to talk about it! More often than we realize, others share the same worries – even (or especially) the most accomplished, inspiring and successful among us. Lesli Boldt, President, Boldt Communications Inc.
Don’t miss out: register for the event! Join us for this special evening on Thursday, April 19, where these eight speakers will bravely take the stage to share five-minute stories of times they’ve tackled imposter syndrome. Be inspired by stories of confronting doubts and pushing through, with advice that may be helpful to you in your own journey.